Breuil-Cervinia sits at the head of the Valtournenche. It’s a resort town, mostly purpose built to support the skiing industry, and we were quite shocked to see the amount of new development since we were there last. There is obviously no shortage of visitors. The development was pretty much the only thing happening in the town while we were there. 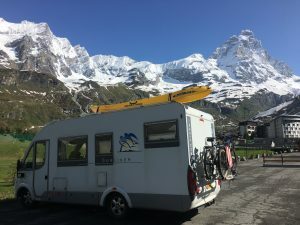 Skiing is supported all year round from Cervinia, but the resort has a month off between the winter and summer season. Winter skiing had only finished the previous weekend, culminating with the visit of the Giro d’Italia and also a very progressive (do these things really still happen?) swimsuit show. It’s been a long season with lots of spring snow, and most hotels and restaurants were closed as staff took well deserved breaks from the hospitality industry, probably by visiting someone else’s hotel. 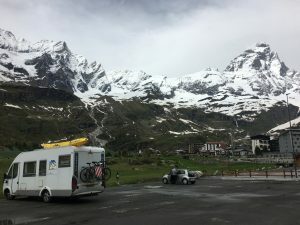 We parked up in the sosta, a 10 minute walk south of the main resort, and took a short walk, sending photos to Aaron to demonstrate the difference between Cervinia’s winter and summer appearance. The resort was so quiet that we decided to move from the sosta up into the main carpark so that we were closer to the start of walks and had a better view. No one was taking payment at the sosta, although when we left on the Saturday the small booth was manned and we felt a little guilty that we had deprived them of some income. From our parking spot we had a view of the golf course where marmots played. These large rodents, members of the squirrel family and closely related to the groundhog, live in burrows in high pasture land and hibernate during the winter. With the spring thaw they come out from their dens to breed and start fattening themselves back up again in the short time they have before they are back in hibernation in autumn. They obviously enjoyed the tasty grass of the golf course and we wondered whether they are seen as a pest or an asset. While some of them eat and some play, others will stand guard like squat extra-furry meerkats and squeak if they feel there is a threat approaching. They didn’t seem to be particularly worried about their audience, only running to their burrows when we got close enough to take a good photo (of course). We laughed at their run, which seems to involve scampering along and then stopping, lifting their tail a couple of times and then repeating the process – scent marking maybe? 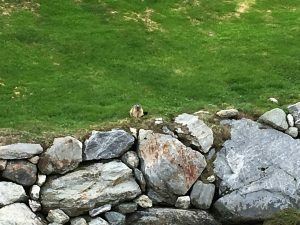 It’s a very distinctive gait and allows us to tell it’s a marmot (and not a dog or cat) from a distance. 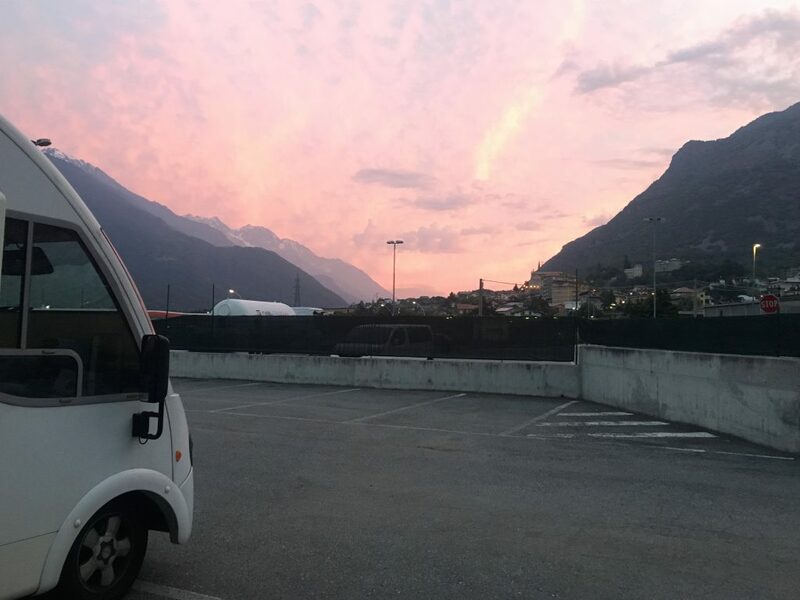 The other thing we could see from our parking spot, the dominant feature of Cervina, is Monte Cervino itself – aka The Matterhorn. It’s classic pyramid shape rises above the ski resort, easily distinguished from the surrounding mountains and forming a focal point wherever you are. We spent hours staring up at it; whether bathed in sunshine or wreathed in cloud the thought of climbing it’s jagged sides is daunting, something we don’t ever expect to experience. It’s hard to believe the audacity of early climbers who used manilla ropes and climbed in tweed jackets. The first ascent of Monte Cervinio was a race between Englishman Edward Whymper and Italian Jean-Antoine Carrel. 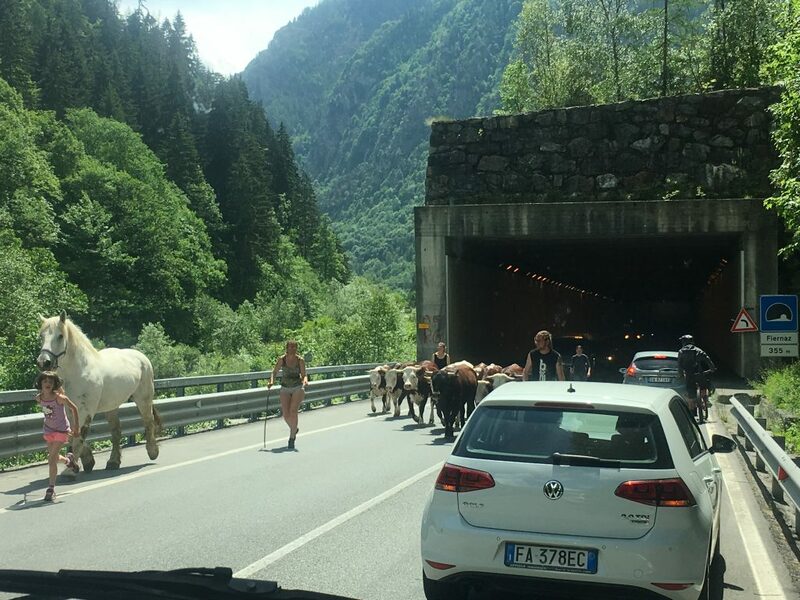 They initially cooperated and later competed to ascend the mountain, and it sounds like it all got a bit school-boy, even now the story takes on a partisan edge depending on who narrates it. But it cannot be doubted that, eventually, after several attempts, Whymper made the first ascent. This was marred by the tragic death of four of his companions who fell thousands of feet as they descended, Whymper and his two guides only survived because the rope that joined them to their falling team members broke. It is said that Queen Victoria considered banning mountaineering as a result of the deaths and controvesy. 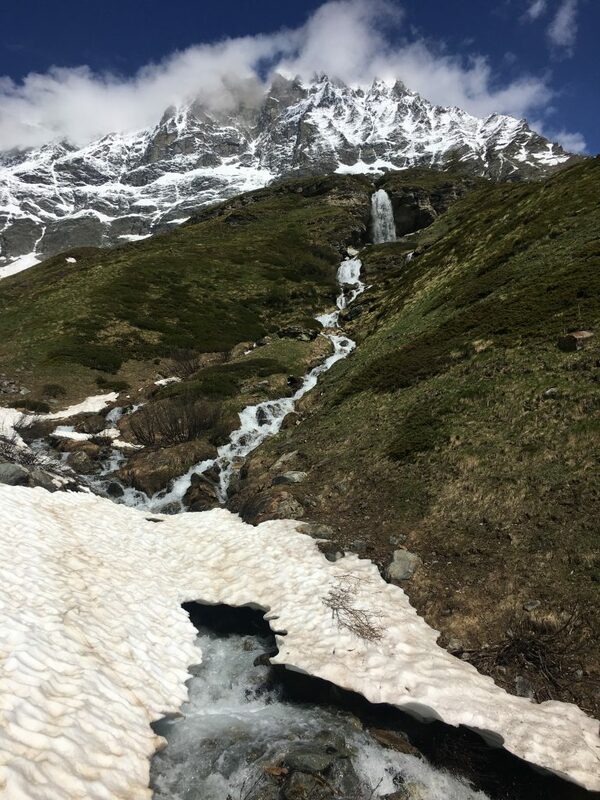 Cervinia’s altitude is just over 2000 meters above sea level – part of what makes it such a great ski resort – and so any walks from here were definitely going to be curtailed by snow. However we did manage three shortish walks. 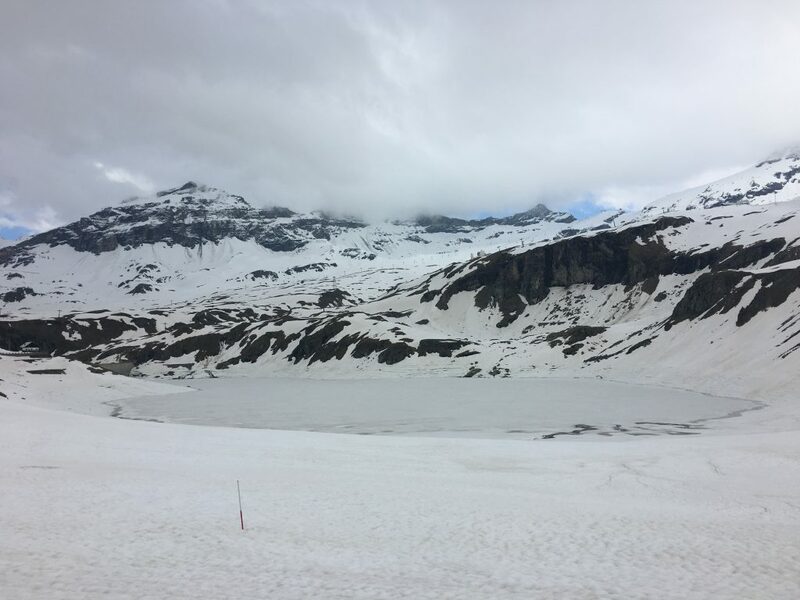 This lake is a feature we have often seen from ski lifts. 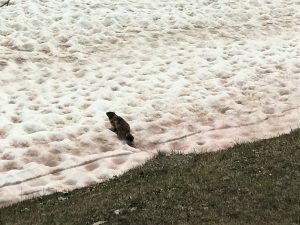 It sits in a bowl on the eastern slopes of the valley and provides the fresh water that is piped to a lot of the slopes to make artificial snow when it’s needed. We took a chance on this walk because the path (route 16) sometimes follows a maintenance track that we thought may have been kept clear. We ended up following the track all the way because where the path took short cuts it was steep and snow bound, but the track had been scraped clear of snow and we made it easily up to the lake which was still iced over. We came down the same way. We spied out this walk from our parking position, looking for the path along the snowy ridge above us and below the steep cliffs of Punta Cors. The route up nearly defeated us as we tried to follow route 11 and found the bridge over the fast flowing stream was out. Unwilling to ford the stream we ended up making our own way up steep grassy banks until we got to the path (65) that traverses the slopes on a fairly flat gradient. Here it was very snowy but firm enough to allow us to walk in our boots without the need for snowshoes (although they would have been useful – they’ve gone on the shopping list) and we made our way along our approximation of the path behind a small lake and along to an abandoned and empty reservoir where we took the old service track down to Cervinia. We spent most of this walk, well…not walking. The spring sunshine was triggering avalanches all along the steep cliffs above us and they were mesmerising to watch. It really gave us an appreciation of the violence and ferocity of an avalanche (after all snow is soft…isn’t it?) as we watched large rocks being thrown down with the snow. And that made us very considerate of the angle of the slopes we were crossing and descending. We got down from this walk in time to eat lunch in one of the few open cafes in the town and enjoyed their focaccia so much that we had some as a take away for our tea. Our final walk took us up as far as we could go towards the Rifugion Duca degli Abruzzo. 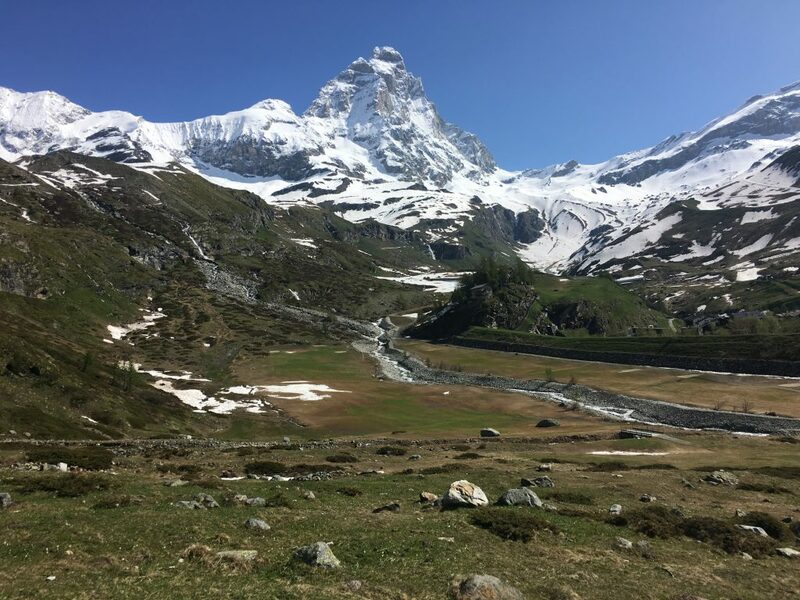 Usually used as a staging post for ascents of the Matterhorn it was at 2802 meters a.s.l. and we knew we wouldn’t get that far, but we decided to see how far we could get. 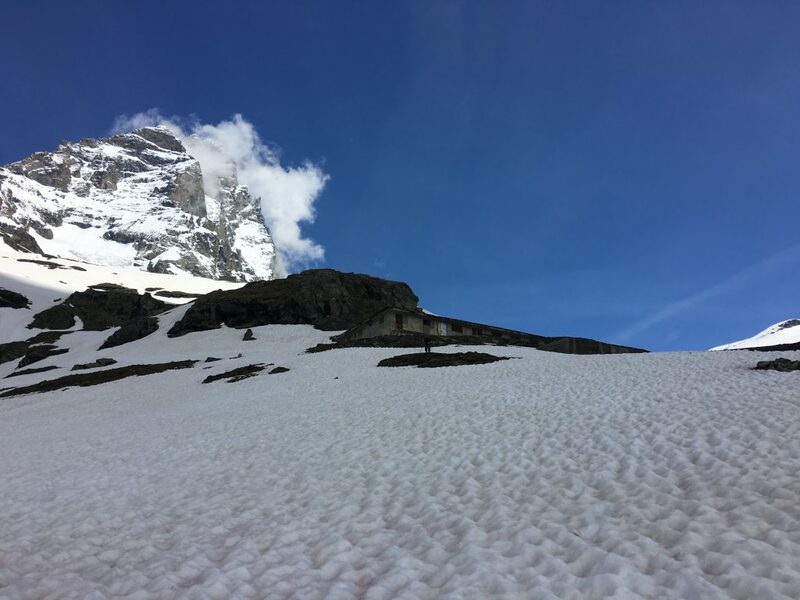 The route mostly follows an easy track and when it’s not snow bound it would be quite a pleasant and easy journey, but we hit snow fields just below the hut at l’Eura. In front of us were a couple carrying snowshoes, but they chose to bypass the snowfields and climb an unpleasant steep and grassy bank instead and stupidly we assumed they knew what they were doing (after all why have snow shoes and not use them) and we followed them. As I watched them nervously find footholds on loose dirt and use grass as handholds I decided there was no way I was going to follow. Paul went up next and provided a running commentary of how uncomfortable he was. After seeing his wobbly legs disappear over the top I decided I definitely wasn’t going to follow and texted him my decision. Instead I went back down the slope to find the path and trudged over the snow to join Paul up at the hut. After our final walk we drove down to Chattilon, back where the Valtournenche joins the Aosta valley. The sosta here was free because the parking meter was not in operation. It was conveniently located by the Conad supermarket and a self service laundry. We washed all of our smelly walking gear, and while waiting for it we shopped in the Conad, picking up some local cheeses from the deli (including Toma, a delicious semi cured cheese that melts beautifully which Paul gave the ‘it’s as good as cheddar’ seal of approval) and some local white wine that had the scent of mountain meadows in the spring.